Hard to say which I enjoy more, attending a party or throwing one! By nature, I'm a planner, so I've always enjoyed planning an event--thinking of a theme (not always necessary, but so southern), selecting invitations, creating a guest list, planning a menu, preparing the food, staging the tables and food, choosing music (Mr. T and C always comes through on this one for me), and on and on. To me, even the cleaning up and the post mortem (with a glass of wine) are so much fun. I find a lot of joy in anticipating, I'm always looking forward to something--it can be as simple as a cup of coffee or as extravagant as a vacation. Mr. T and C, however, is more of an "in the moment" kind of man, and--because of that--I have learned so much from him, including enjoying someone else's party. Two of my all-time favorite parties are annual events, and this past Saturday night, we attended one of them. One thing we love about this party is that it is the same from year to year. The invitations are rustic, depicting an empty rowboat resting on the bank of a lake. The setting is a boathouse on Lake Summit in the mountains of North Carolina. The food is simple and terrific. Before dinner we have pimiento cheese (made with toasted pecans) and plain crackers, the perfect vehicle for the amazing spread; cold green vegetable crudites (asparagus, cucumber spears, haricort verts) on a white platter with a garlicky dip; and heirloom tomato sandwiches on super thin asiago bread with Duke's mayonnaise. While the adults are feasting, children are enjoying the corkscrew slide or jumping into the lake via the second story rope swing. 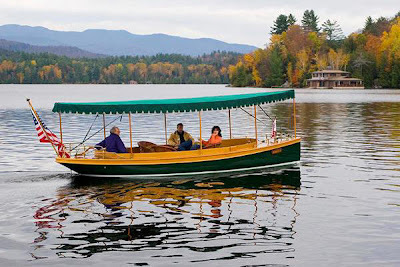 The hosts always invite guests for a ride on the couple's beautiful electric canopied boat. 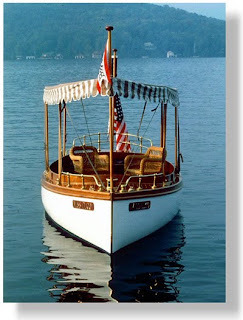 Custom built by the Elco Company in New York, the boat is gorgeous wood, teak and mahoghany, outfitted with a worn Persian rug and antique wicker furniture. Three beautiful camps, including the reknown Camp Greystone for Girls, are set on Lake Summit, and only 120 homes surround the lake. It is blissfully peaceful. At seven, we have a grilled sandwich invented by the host--a beef hotdog, wrapped with ground sirloin and served with a secret sauce on a bun specially made by a bakery for these sandwiches. The host came up with the idea when he couldn't decide if he wanted a hotdog or a hamburger. They are not gourmet but for this evening, they are perfect, and enjoyed by young and old. I have seen ladies who ordinarily do not eat more than two celery sticks a week, clean their plates and lick their fingers. For dessert, a selection of brownies is offered--toffee, coffee, mint, raspberry, M and Ms, walnut, Oreo, and brown sugar. All the varieties are cut the size of postage stamps, so you can taste each without too much guilt. The mint are always the first to go. My favorite is the coffee. At eight o'clock, guests say their goodbyes and head back down the mountain. A perfect evening comes to a close, and I enjoyed every minute. Thank goodness, there's always something to look forward to.